19. June 1999. 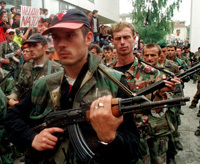 Izdaje NIP „GLAS“ a.d.
SRBICA - Kosovo Liberation Army (KLA) guerrillas summarily took over a north Kosovo town Srbica on Friday despite their commitment to "demilitarize" and French peace troops rushed to the scene, Reuters reported referring to unnamed French officer. The French dispatched tanks from their base in the northern city of Mitrovica towards Srbica 20 kms (12 miles) away. KLA guerrillas entered downtown Srbica, firing multiple rounds from their weapons into the air, French officer said. PRISTINA - Albanian terrorists on Friday killed Blagoje Stankovic from the village of Strezovice and Novica Vasic from the village of Oraovac, in Kosovska Kamenica municipality, local authorities confirmed to Media center. There are still no KFOR members while several groups of armed Albanians were noticed in that town. The members of KLA killed Stanojko Mihajlovic in front of his house in the village of Novo Selo, in Kosovska Vitina municipality local authorities confirmed. 12 Serbs from that village were kidnapped during the last two days, while all Serbs from Grabovo, Gusica, Pozaranje, Novo Selo, Drobes and Tankosic, in Vitina municipality left their villages. On Friday morning, the group of terrorists violently fell into Medical center in Gnjilane and beat thoroughly director's representative Vladimir Denica. KFOR intervened in the local post office and threw tyrants out of the building. During the afternoon, peace forces put control points in mostly entrances to Gnjilane. BONN - The Group of Seven major powers (G-8) on Friday approved their biggest international debt relief package yet, which could lead to the write-off of about one third of all the loans owed by the world's poorest countries, German Chancellor Gerhard Schroeder said. BELGRADE - Chairman of Yugoslav only car maker, state-owned Zastava from Kragujevac, Milan Beko confirmed on Friday that Italian KFOR soldiers had seized its chassis plant in Pec. The Italian soldiers entered Zastava's premises on their own. I cannot tell what's going on in Pec, but we see one good thing in this. The Italians can protect the factory for us until things get more clear," Milan Beko said. "I am confident that the Italians will protect our factory conscientiously both from possible destruction and a takeover," Beko said. BONN - German soldiers on Friday freed about 15 prisoners recently tortured in an abandoned police station in Prizren, occupied by the Kosovo Liberation Army but came too late to save one who had died only hours earlier, German agency DPA reported. Captain Hans - Christian Klasing said that all the members of KLA (around 30) were immediately registered and disarmed. The dead man, about 70 years old and not immediately identified, was found beaten and handcuffed to a chair. According to the German officer, released prisoners were mostly gypsies, but three Serbs were among them. PRISTINA - Outside Pristina's Grand Hotel, which is under "siege" of more than 1,500 journalists from the world over, several buses from Gostivar and other parts of Macedonia arrived shortly before noon on Friday. The Albanians are on mass returning to their homes in Pristina. Late on Thursday, the Grand Hotel was also toured by a group of members of the so-called KLA, wearing military uniforms. They did not carry arms, but they marched through the hotel lobby, mingling with foreign journalists only to leave after that. Several KLA members in uniforms were also seen in the streets of the Kosovo capital on Friday. Gas stations in central Pristina were demolished late on Thursday and early on Friday morning. Center for Peace and Tolerance press service issued a statement on Friday, saying that unidentified persons with emblems on their T-shirts also appeared near the St. Nicolas Church, harassing Rev. Miroslav. Slobodan Acimovic from Urosevac was robbed of his car in central Pristina, the statement said, adding that a group of Albanian civilians took to the streets in Pristina's Suncani Breg suburbs, stopping cars and checking the residents. Branko Cukic disappeared in the Devet Jugovica suburbs, Slobodan Stolic was abducted near Stimlje, and Branko Markovic disappeared in the residential area of Vranjevac. Stanislav Kocic and Desimir and Nebojsa Stolic were also reported missing in this infamous Pristina suburb, while Dragan and Milutin Dimitrijevic were abducted there. Early on Friday, a group of Albanians put under siege the Clinic Hospital in Pristina. They forced their way into the hospital building, claiming they worked there. As Clinic Hospital director Rade Grbic and Dean Radica Radovic argued with a group of unidentified Albanians, led by a certain doctor Mazlum Belegu who had allegedly returned from abroad, KFOR troops arrived. A senior KFOR officer told the group that they entered a hospital with more than 700 patients, who needed peace, not unrest. Political scores cannot be gained outside a hospital, the officer scolded them. After that, the situation calmed down for a while, but the group of Albanian civilians, including some individuals, who carried weapons, remained within the Clinic Hospital grounds. On Friday, a large group of Albanians from Albania attacked the houses of ethnic Gorans in the area around villages of Orcusa and Krusevo in the Dragas municipality, a Center for Peace and Tolerance statement said. The same source confirmed that a large group of armed Albanians had opened fire at the Medical Secondary School in Pristina, the home of refugees from Croatia, at about 1:00 p.m. on Friday. In the village of Gatnje near Urosevac, Novak and Zorka Kolarevic were reported missing and the eighth-member family of Jokic was abducted in the village of Gusica near Kosovska Vitina. The abductors demanded the release of a local policeman in exchange for the kidnapped family. A large group of Albanians rallied outside the Dositej Obradovic elementary school in Pristina's residential area of Ulpijana, rising an Albanian national flag on it. Center for Peace and Tolerance said that a larger group of armed Albanians went down from the forests in the Lipljan municipality and entered the village of Goles, a few kilometers from Slatina airport, which is under control of the Russian KFOR troops. All Serb houses in the village were torched. Center for Peace and Tolerance also reported that Zoran Raicevic was abducted in Pristina's residential area of Vranjevac, while Jovica Kordic was reported missing in Vucitrn. COLOGNE / HELSINKI - All issues concerning Russia's participation in the international peacekeeping forces in Kosovo (KFOR) have been resolved, US President Bill Clinton said on Friday upon his arrival in Cologne for the summit of seven industrialized world nations plus Russia. However, US-Russian talks on Moscow's participation in KFOR continued in Helsinki on Friday morning. Russian foreign and defense ministers Igor Ivanov and Igor Sergeyev, as well as their US counterparts Madeleine Albright and William Cohen, took part in the meeting. "Everything is going to be OK. We'll strike a deal," said Russian delegation member Boris Mayorski. Finnish President Martti Ahtisaari on Thursday met US and Russian foreign and defense ministers. As reported, Ahtisaari convened the meeting in order to get information about the progress of talks. BRUSSELS - On Friday, NATO urged the Serbs not to flee Kosovo and promised that KFOR would intensify its actions to protect their rights and prevent attacks on the Serb population and their property. NATO spokesman Jamie Shea also said NATO commanders late on Thursday "submitted for signing" to separatist KLA leaders a technical agreement on procedures and deadlines for their demilitarization. He said that the KLA could not become "an army or armed force with heavy weapons," but only one of the political groupings in Kosovo, adding that it could be "partly incorporated into the future civil police, established on democratic principles". Shea described the fact that the Serbian Orthodox Church head, Patriarch Pavle, had gone to Pristina on Thursday and tried in his meetings with KFOR Commander Michael Jackson and UN envoy Sergio Vieira de Mello to influence the Kosovo Serbs and Bishop Artemije of Prizren not to leave Kosovo, as "very important". TETOVO - The head of a self-styled provisional government of Kosovo has urged Serbs not to flee the Yugoslav province, promising that its ethnic Albanian majority is not out for revenge. "I appeal to the Serbs to return to Kosovo," said Hashim Thaqi, leader of the political wing of the Kosovo Liberation Army (KLA), the separatist guerrilla movement that battled Serb forces until NATO forces entered last week to impose peace. Thaqi told Reuters in an interview on Thursday night that there would be a role for all ethnic groups in the future of Kosovo, where ethnic Albanians made up 90 percent of the pre-crisis population. "Albanian society needs the Serbs. They can make a great contribution to the stability of Kosovo," he said, speaking through an interpreter in the Macedonian town of Tetovo. Tens of thousands of terrified Serbs have fled Kosovo with retreating Yugoslav security forces, fearing retaliation from ethnic Albanians for the killings and repression of past months. Thaqi, named by various ethnic Albanian groups including the KLA as leader of a future government in the Serbian province, said Yugoslav President Slobodan Milosevic carried most of the blame for the repression and ordinary Serbs had nothing to fear. "We did not start the war to carry out our own ethnic cleansing in Kosovo. We started to fight because we wanted equality...and to establish a democratic order." "The massacres were not carried out by ordinary Serbs but by the regime. We have no plans to organise any repression against the Serbs. They were also the victims of this war," he said. The agreement between the major powers and Yugoslavia which cleared the way for the entry of a peacekeeping force says nothing about the establishment of a provisional government. Until elections can be called, the United Nations is expected to take over the effective running of Kosovo, which the accord specifies will remain a province of Serbia, although with broad autonomy. But at Rambouillet, France, in February the international community also agreed with ethnic Albanian leaders that the status of Kosovo should be reviewed after three years, raising the possibility of full independence. It was Milosevic's refusal to sign this accord, and his subsequent crackdown on ethnic Albanians, that triggered the NATO air campaign which bludgeoned Belgrade into settling. Around 1.5 million ethnic Albanians fled from the repression and NATO bombs into neighbouring Macedonia and Albania, or hid out in the hills of the rugged province. Thaqi urged the refugees to be patient about going home. "I appeal to the refugees not to become euphoric because there are many mines in the villages and the cities. We are trying to organise their safe return with the Macedonian and Albanian governments and international organisations," he said. He reaffirmed that the guerrillas were ready to abide by the terms of the Rambouillet pact calling for them to demilitarise. "Disarmament is not an issue. We will respect the accord signed in Rambouillet," he said. Thaqi said he was preparing to travel to Pristina, capital of Kosovo, "within a matter of days" to start work on setting up a political structure. But the ethnic Albanian political leadership is still fragmented, with long-time leader Ibrahim Rugova so far refusing to join the KLA inside the so-called provisional government. Rugova, an apostle of non-violence, was twice elected president of a self-styled "Republic of Kosovo" in the years after Milosevic stripped the province of autonomy in 1989. Thaqi said he was willing to meet Rugova at any time but at the moment he had no idea where he was. "I invite him to come to Pristina to meet me there. He has his place in the political movement in Kosovo," he said. "It is his responsibility to join us because he signed the Rambouillet accord." "Three years, five years, it doesn't matter. The important thing is to re-establish normal life in Kosovo and to recognise that we have the right to determine our own future," he said. PARIS - French Defense Minister Alain Richard advocates the deployment of members of different national communities in Kosovo in separate zones, believing it could save the integrity of the southern Serbian province. Cohabitation of various national communities in Kosovo would "undoubtedly become easier if they settled down in different zones," Richard said. According to a report published by the Senate, Richard expressed this view - which practically amounts to setting up ethnically pure zones in Kosovo and Metohija - in Foreign Affairs and Defense Committee in the Luxembourg Palace (the Senate) on Friday. Richard estimated that "deployment of the population is broadly much more desirable than a division" of Kosovo, the same source said. PODGORICA - (Reuters) - Montenego's Prime Minister on Friday reiterated a threat to hold a referendum on independence from Yugoslavia and spelled out what it would take to stay with Serbia in the federation. Premier Filip Vujanovic said Montenegro, the smaller of the two republics making up Yugoslavia, wants the federation to agree to redefine its status within the federation or it would go ahead with the referendum. "Rejecting Montenegro's proposal would confirm intentions of the government in Serbia to create a unitary state," Vujanovic told a news conference. Montenegrin President Milo Djukanovic said earlier this month that the country would hold a referendum on whether to break away from Serbia when the time was right. Vujanovic explained on Friday what Montenegro wanted in order to stay. "The essence of our demand to redefine present relations with Serbia is made up of principles which will not allow an abuse of existing (government) bodies to Montenegro's disadvantage and which will secure equality of Montenegro in Yugoslavia." Measured by its territory and economic strength, Montenegro accounts for some five percent of Yugoslavia. It was given equal representation with Serbia in the 40-seat Upper House of the Yugoslav parliament. But the delegates from Montenegro are from the opposition party allied to the Belgrade regime instead of from Djukanovic's reform-minded coalition which won 1998 elections in Montenegro. Vujanovic said the republic wants to be sure its interests are properly represented in the Upper House and that the Yugoslav justice ministry and the army do not abuse Montenegro. It also wants the Yugoslav Prime Minister to be elected from the ranks of the Montenegrin ruling party. Under the Yugoslav constitution, since President Slobodan Milosevic is from Serbia, the federal prime minister comes from Montenegro. But the man chosen as Yugoslavia's Prime Minister, Momir Bulatovic, leads the opposition Socialist People's Party in Montenegro, which is allied to Milosevic's ruling Socialist Party of Serbia. "If Serbia does not accept our offer, then the people of Montenegro will have to decide, in a referendum, if they want such a unitary federation, which I personally think they cannot accept," Vujanovic said. He accused the Yugoslav government of deliberately keeping in force the State of War, declared when NATO began bombing Yugoslavia on March 24, so as to maintain federal army control in the republic. "They want to maintain a regime in Montenegro which gives the army powers of a civilian government, to keep in place war criminal laws which restrict human rights and preserve censorship over the media to protect them from responsibility for what they have done," Vujanovic said. He saw Milosevic's position as being significantly damaged after being indicted for war crimes. Because of the indictment, the Yugoslav leader could not travel to Kosovo, because "the international peacekeeping forces could arrest him there". "What happened in Kosovo represents a capitulation of Milosevic's policy. I believe that his government cannot last long because it has inflicted huge damage, to Serbia and Montenegro." BELGRADE - Yugoslav President Slobodan Milosevic on Friday received eminent Greek composer, famous humanitarian and proven friend of Yugoslavia Mikis Theodorakis. My Zorba Believes in Freedom! Music is powerful in a political sense, but I have never used it for that purpose. I judge people on the basis of their culture. The Orthodox people are not bad believers at all. Late on Thursday, Mikis Theodorakis, the greatest living Greek composer, arrived in Belgrade. As of early Friday, he was patiently answering the questions of Yugoslav journalists. In a quiet corner of the National Museum Atrium, he gave an exclusive interview to Glas Javnosti. Apart from unforgettable works you created as composer, you have devoted a large part of your life to politics and the struggle for freedom. How do politics and music get along? Music is powerful in a political sense, but I have never used it for that purpose. I have never wanted to create music to serve political activism. It is well known that music can express the feelings of freedom, love, democracy and that is where its power lies… Today's Europe has disgraced itself; it is dominated by the American culture, so it would be very difficult to change its image by means of music alone. What remains for us is to try to listen to the American music to a lesser degree and not to lose our own roots, cultural traditions and historical memory. I judge people according to their culture, not according to the amount of dollars they have. Do you judge the Serbs in that way? You have shown that a small nation can say "no" to a superpower and it is there where your victory lies. I think all this was about an attempt by Clinton, who tried to set an example and use it in the future to scare off other potentially "disobedient" nations. In this instance, the point was not in the religion. Catholics, Protestants and Jews are much more zealous than the Orthodox. The Orthodox religion is warm and open-minded and it does not exert pressure on people. But it does not necessarily mean that we the Orthodox are infidels or bad believers. Simply, we are not under pressure as members of other religions are. However, there is something else: they think Catholics, Protestants and Jews are on one side of the line, with barbarians on the other one. My Zorba the Greek is a believer in freedom and liberty! Even though it was announced that Theodorakis would conduct the orchestra at the humanitarian concert of "Zorba the Greek" ballet piece at Kolarac Endowment at 8:00 p.m. on Saturday and hold a soloist concert in Artistic and Cultural Society Lola Ribar hall, as well as another one in the open at the Republic Square, for the Greek composer himself, obviously, this visit meant much more than a music event. It is proved by the fact that Theodorakis, who came to Belgrade together with his family, was accompanied with eminent Greek lawyer Likouresis, the one who had filed suit to the Hague-based International Court of Justice against NATO military and political leaders, charging them of aggression against our country. They also brought in 15 tons of humanitarian aid in food and medicines. Yugoslav national basketball team left for Toulouse on Friday, after the match against the Ukraine. A "rehearsal" ahead of the start of the European Championship in France offered Zeljko Obradovic an ideal opportunity of solving his last dilemmas. "There are two days left before our first match in which we are meeting Israel. We will take advantage of them to a maximum to adjust to the sports hall and playing conditions in Toulouse," Obradovic said. Have you resolved the dilemma which two of the players will be the odd ones? "It is a tricky question, the most difficult up to now. All our basketball players are here in France and tonight I am going to make up my mind," replied Obradovic. "European soccer house" eliminated Obilic from international competitions and tournaments with an explanation that the club's top officials were "unsuitable". UEFA also said that as long as these people remained in the club, Obilic would not see European competitions at all! "UEFA has proved again it is not a non-political organization but, unfortunately, Obilic is its victim," director Zoran Petrovic said. "As the decision went into effect and we were denied the right to file a complaint, we were left with no option but to comply." Petrovic also indicated that top officials of the so-called "Knights", who had led the club to the very top of the Yugoslav soccer, planned to resign to spare Obilic of UEFA's wrath in the future! "We are thinking about appointing a new leadership to avoid the same embarrassment in the next season," Petrovic revealed. I Really Suffered an Injury! "I am close to signing for Panatinaikos since I did not want to take my chances with the NBA"
"I came from San Francisco here to Treviso on Friday," the voice of our famous center forward finally echoed on the other side of the line. After four years, you will not play for our national basketball team? "All this is very hard for me. I am especially unhappy when I hear that my health is being questioned. There are some rumors that I am safe and sound and that my contract in the US was more important to me than to play in the national team. It hurts me deeply because I know it is untrue. I suffered an injury. Period! Greek media reported that you had signed a contract with Panatinaikos? "No, I have not yet. We have reached an agreement in principle but it is still far from a wrapped up contract. We cut a 90 percent deal, but the remaining - and the most important - 10 percent include the biggest hurdles. We have had some disagreements over defining these things. Today I will meet Panatinaikos top officials and, if we complete the negotiations successfully, it is highly likely that I will sign the contract immediately after that." Why did the NBA option fail? "It did not fail. I simply did not want to wait any more. Clubs of the strongest world league were very interested in me, but problems arose when I said I wanted to settle my status in the club in legal terms. I asked for a decent playing time of more than 25 minutes in every match, but they could not give me such guarantees in written… I have been told to wait, that everything will be OK. Overseas players who want to join the NBA can sign contracts no earlier than on August 1. For me, it was too late… In Europe, all teams are completed by late July, so I would be left in the lurch for the next season, namely without the right engagement," Rebraca says frankly. Are you going to France to root for your fellow players in the Yugoslav national team? "I will certainly go to Paris to watch quarterfinal, semifinal and final matches. If I finish my business earlier, I will join the national team even in Toulouse or Pau." What do you think about the prospects of our national team in the forthcoming European Championship? "We have the highest-quality national team in Europe and we are going to prove it in France. The forthcoming Championship will be the most challenging one because many NBA players will take part in it," Rebraca concluded.